Get more information about Video Codec for Windows (VfW Codec) architecture. VfW Video Codec include: VfW XviD Codec, VfW H.264 Codec, X264 codec, VfW H.264 Codec and VfW AVI Codec for Windows Media Player. Following are several VfW Codecs for you to play H.264, XviD, AVI, MPEG, MPEG2, MPEG4 files. x264 - a free h264/avc encoder is a free library for encoding H264/AVC video streams.The code is written from scratch by Laurent Aimar, Loren Merritt, Eric Petit (OS X), Min Chen (vfw/asm), Justin Clay (vfw), Måns Rullgård, Radek Czyz, Christian Heine (asm), Alex Izvorski, Alex Wright and Jason Garrett-Glaser. It is released under the terms of the GNU GPL. Etymonix MPEG-2 Video Codec can be used with a wide range of existing applications (such as Adobe Premiere, Fractal Design Painter, Ulead Video Studio, Ulead MediaStudio Pro, Windows Media Player, Macromedia Flash MX) that support VfW codecs. Typically, these applications will store the compressed MPEG data generated by the codec in an AVI file. A wide range of resolutions and frame rates (including NTSC and PAL) are also supported. Etymonix MPEG-2 Video Codec is specifically engineered to preserve quality during image processing while providing better compression than lossless solutions. AVIcodec is a free multimedia file analyser for Windows. AVIcodec gives detailed information, especially the codecs needed to play the file, and where to download those codecs if they are missing on your system. 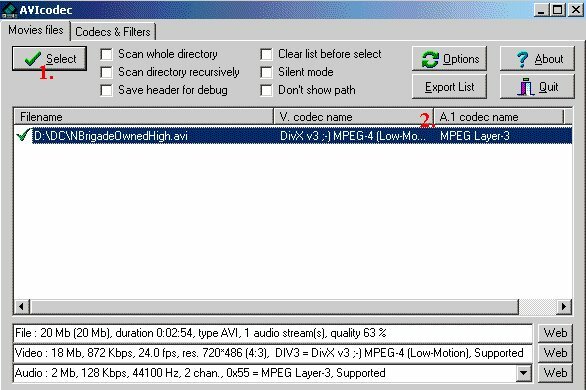 AVIcodec is a very useful tool that helps you identify the codec used by video files. As you may know, most video files have a simple AVI, MPEG etc. extensions, however some of them may require additional codecs like DivX or VCD and others. When trying to run such a file, and you don't have the proper codec installed, you will get an error message, or may be limited to audio playback only. KoolPlaya will play any video file (Mac Video File Converter) if you have the appropriate codecs installed KoolPlaya can play any video file if you have the appropriate codecs installed and has lots of features. The REALmagic MPEG-4 Video Codec is compliant with ISO MPEG-4 Advanced Simple Profile level 5 (without quarter pixel (QPEL) and global motion compensation (GMC)). REALmagic MPEG-4 Video Codec is fully compatible with the REALmagic Xcard, Sigma Designs high-performance multimedia playback PC card. The REALmagic MPEG-4 Video Codec supports both progressive and interlaced video encoding with arbitrary bit rates, resolutions, and frame rates. REALmagic MPEG-4 Video Codec uses advanced encoding tools defined in MPEG-4 advanced simple profile to provide the highest video quality at low bit rates. This document explains how to use the Video for Windows (VFW) interface of REALmagic MPEG-4 Video Codec, and how to configure the codec for optimum quality. 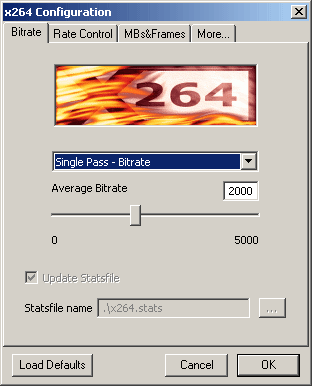 REALmagic MPEG-4 Video Codec includes four rate control modes: constant bit rate (CBR), variable bit rate (size), variable bit rate (quality) and variable bit rate (quantizer). REALmagic MPEG-4 Video Codec fully supports interlaced video encoding. Interlaced video is most commonly found in material intended for TV broadcast. Depending on your decoder, header information may cause compatibility issues during playback. The REALmagic Xcard supports RMP4, DX50, and DIVX. Etymonix SoftReel is a faster than real-time MPEG-2 video decoder that has been optimized extensively for single-core and multi-core systems. It enables smooth high-quality playback of native MPEG-2 video files (MPG, VOB, DAT, M2P, M2V, ATI MP2) and compatible AVI files ('EM2V' and 'PIM2' formats) up to HD 1920x1152 in Windows Media Player and other DirectShow-compatible applications. SoftReel's robust design makes it resilient to bitstream errors (e.g. from transmission glitches or scratched video discs). It has been extensively tested on a wide range of x86 processors and Windows operating systems.